The Fujinon Stabiscope binocular gives a steady image while observing from a vibrating platform. The image intensifier tube electronically amplifies very slight light 20,000-30,000 times so that you can see objects at night, too. It's compact, lightweight and waterproof. 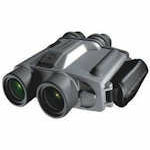 The Fujinon Stabiscope Night Vision binoculars integrate an image-stabilizing gyro system with starlight technology night vision in a 12x40 waterproof binocular. The image intensifier eyepieces are available in either generation 2.5 or generation 3.